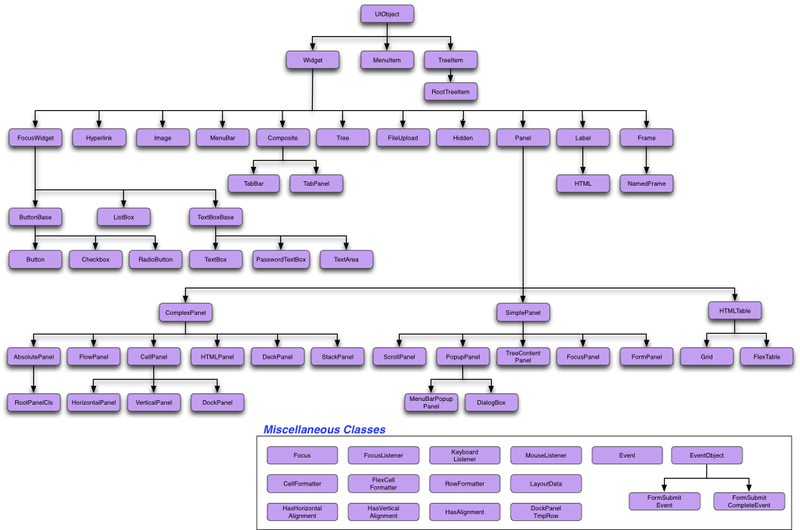 The ui module defines the classes shown in the diagram, below. All user-interface widgets that will place something on-screen are derived from UIObject. Anything which takes keyboard as well as mouse input is derived from FocusWidget; except for Tree, TabPanel, TabBar and MenuBar, all classes that can contain other widgets are derived from Panel. HTMLPanel and its derivative classes, Grid and FlexTable are slightly different, again, in that their add() functions all take row,column arguments. They also provide Row and Column formatting, so that, in the case of FlexTable, you can indicate that a cell should span additional rows and/or columns.